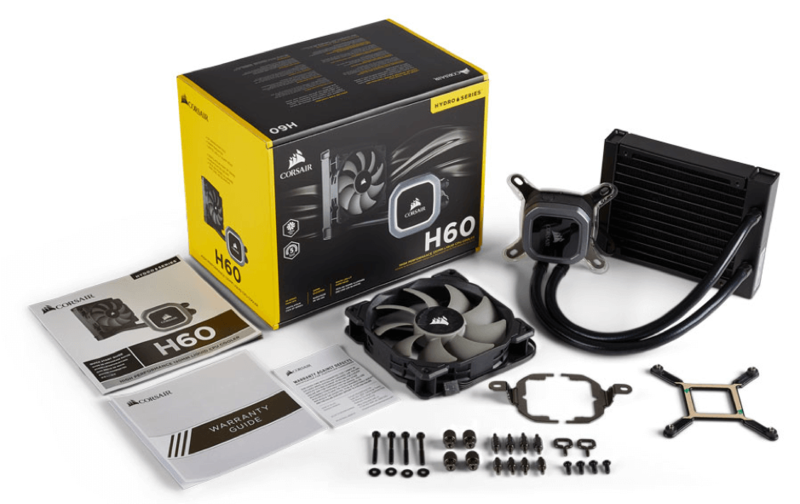 Sharing many similarities to the Hydro Series H150i Pro and H115i Pro all-in-one cooling solutions, Corsair has introduced a refresh of the H60 cooler. The new model adds white LED lighting to the water block and has smooth black tubing. The 120mm slim-radiator can fit just into almost any place where a standard 120mm fan mount exists. The included SP series 120mm PWM fan can be set to run between 600 and 1,700 RPM to reduced noise when desired and maximize performance when pushing the limits of your processor. When cranking up the fan, air flow can reach 57.2 CFM. This is slightly up from the 54 CFM on last year's H60 model. Noise is also reduced by just over 2 dBA from 30.85 dBA down to 28.3 dBA. To differentiate between the new and old models on sites that may use the same picture for both, note that the 2018 model is SKU CW-9060036-WW. Two sets of mounting brackets are included in the box to support AM4, LGA 1151, and LGA 2066 sockets. The installation is designed to be tool-less and takes just a few minutes. The H60 could be a good fit for smaller form factor cases that do not have room for bulky air coolers and it also can work well in standard-size cases to improve aesthetics. The minimalist approach leaves plenty of open space for easy access to other components. Corsair is confident in product quality for the H60 and is providing a comprehensive five-year warranty worldwide. The Hydro Series H60 is available now from Corsair and authorized distributors globally carrying a suggested retail price of $69.99.